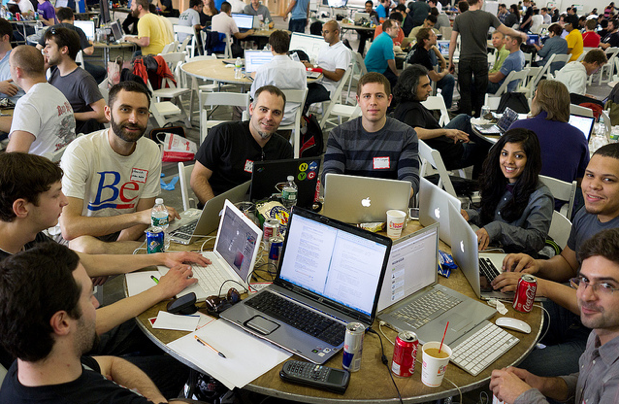 The popular Disrupt Hackathon was back in New York this year and was better than ever. Fueled by pizza, beer and Red Bull, the Hackathon event began Saturday afternoon and went through Sunday morning, May 21st – 22nd. 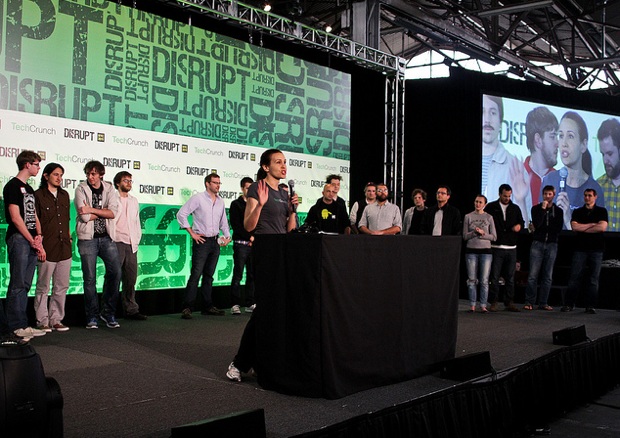 After a lightning round of demos and judging Sunday afternoon, the best teams were chosen and the winning team will present on stage at Disrupt on Wednesday, May 25th. This is a great opportunity for superstar hackers to share the spotlight alongside the top startups chosen from Disrupt’s Startup Battlefield. 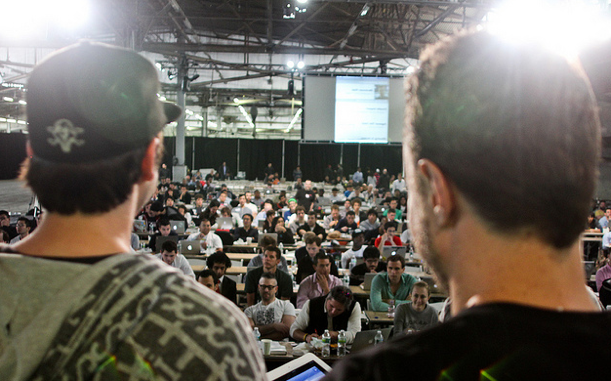 We had over 500 hackers at the 2011 NYC Hackathon event – our largest yet! It all took place on Saturday, May 21 – Sunday, May 22, at Pier 94. It’s been a whirlwind twenty-four hours: yesterday, hundreds of talented coders poured into New York City’s Pier 94 for a marathon session of coding that ran through the night. At 9:30 AM this morning, they pushed their last lines of code. And beginning at 10:30 AM, each of them took the stage for a rapid-fire series of quick pitches showcasing what they’d built. Now it’s time to announce the winners. The top four teams will each get a chance to show off their app during the third day of TechCrunch Disrupt (there are also two honorable mentions). Congratulations to the winners, and to all of the extremely talented hackers who made it through the night and built some very cool apps. In addition to the winners below who were chosen by our team of judges, Palantir is giving $1,000 of Amazon Web Services to the company with Best Data Integration, which goes to Who Data. And TokBox is giving a 16GB Samsung Galaxy Tab 10.1 for best use of the OpenTok API (the device will be released June 8) to Movie Wars. Taking the Judge’s Choice award is Gilt-ii, the ingenious browser bookmarklet that lets you create auctions around Gilt sales. You can see our full overview of this nifty app right here. Docracy– share and sign legal documents. In case you missed it, hackers were busy building new ideas and products at TechCrunch Disrupt’s Hackathon in New York last night. Fueled by RedBull, coffee, and massive quantities of junk food, hackers burned the midnight oil last night, preparing to show off their designs to the judges, who included VC Jeff Clavier and Canv.as founder Christopher Poole, and Google VP of Product Bradley Horowitz. 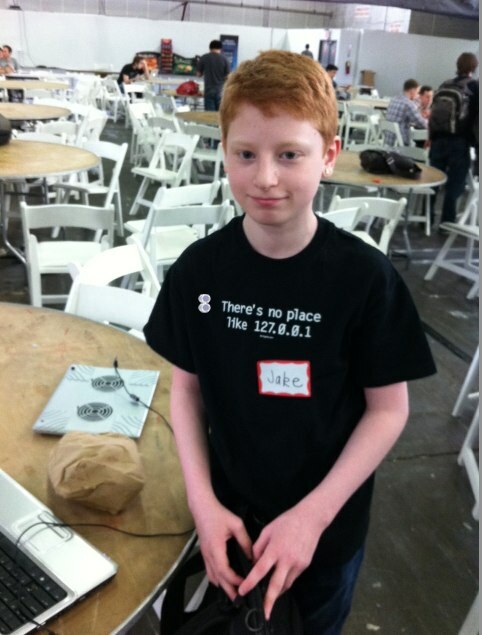 We had a chance to sit down with the event’s youngest hacker; fourteen-year-old Jake Essman. Essman, a New York native, teamed up with fellow engineers Jesse Leone, William Li, and Feliks Beygel to create buyby, a shopping search engine. BuyBy is fairly simple—you use the site to find where a product is located at a store. So you could search for a ‘white t-shirt’ and the search engine will not only show you a list of online stores that have that product, but it will also show you stores that sell the product nearby your location. Essman, who has been coding since he was ten, says that he decided to come to the Hackathon at the urging of his Mom. A student at the United Nations School, Essman says that coding is a hobby, and this isn’t the first site he’s created. RantingOutLoud, a forum where anyone can can complain about anything, is a also Jake Essman project. What’s more, he essentially taught himself how to code. But for Essman, coding is still just a hobby and at this point, his career aspirations lie in the field of medicine as his goal is to become a doctor. Awww. We’re midway through the TechCrunch Disrupt Hackathon (which, by the way, you should be watching live here), and the range of stuff that the hackers have managed to throw together in a mere 24 hours is astounding. Some are trying to find their big payday — others are going for the cool factor or a quick laugh. Some, however, spent their weekend trying to change the world for the better. It’s the job hunter’s biggest conundrum: the more you need a job, the harder it is to get a job. Lose your job, and you’ll run low on cash. Run low on cash, and you can’t pay for your cell phone — but once you’ve ditched your cell phone, it’s a whole lot harder for potential employers to get in touch. Hackathon group Joinable is trying to solve this problem by providing non-profit organizations with manageable voicemail boxes which they can give out to their patrons/beneficiaries for free. Take, for an example, a homeless shelter. The homeless shelter designates an administrator, who then adds accounts for each person they wish to provide with a toll-free 800 number connected to a voicemail box. 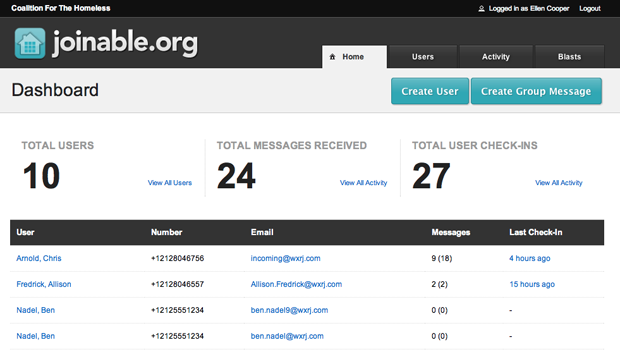 That number can also receive text messages, and each user is given a unique e-mail inbox. From the administration page, admins can view how many messages each user has received (to see how well their job hunt is going), how recently each user has checked their voicemail inbox (are they still out there searching? ), view text messages and transcripts of voicemail messages (are they using the box for its intended purpose? ), as well as send out mass message “blasts” to all users under their management (like job hunting tips, or news alerts). Homeless shelters are an easy example, but certainly not the only one. Probation officers could keep an eye on the job hunts of those under their watch, while organizations like mental health treatment programs or battered women’s shelters could ensure that they always have a secure way of contacting those they’re trying to help. If it’s a non-profit organization that ever needs to reach out to those who may not have any extra cash for a cell phone bill, there’s probably a use or two to be conjured up. While there’s currently no user-accessible sign-up process (hey — they built it in 20 hours over the weekend), you can check out an interactive demo of the administration back-end right over here. Presentations for the TechCrunch Disrupt Hackathon are in full swing (tune in for the live stream! ), and we’ve already seen some very nifty nascent apps and services. One that just caught my eye is NerdNearby, a simple app that detects your current location and presents every tweet, Foursquare check-in, and Instagram photo that has been shared from that area in the recent past. In other words, it’s sort of like Color meets a jumble of geo and social APIs. There’s no signup process — the only thing you need to do is grant the site access to your location (a feature that’s supported by modern browsers on both PCs and phones). The content is presented in a simple interface pictured at right that looks quite nice in mobile browsers. Obviously it’s basic, but that’s to be expected from a site that was built in less than 24 hours. Some obvious potential improvements: support for more APIs and a way to filter which services you want to pull content from. Of course, there’s still the question of whether this content will be interesting — you’re going to run into plenty of Twitter updates that aren’t really relevant to the place they were posted from. You can follow the progress of the project on their Twitter account, NerdNearby. At the TechCrunch Disrupt Hackathon today, local hackers Bill Magnuson and Jon Hyman presented an e-commerce plugin for flash sales site Gilt.com that is worth a look. Called Gilt-ii, the bookmarklet allows Gilt members to auction their items in their shopping cart during the actual buying process. Gilt’s CEO Susan Lynne has said in the past that gaming elements play a big part in Gilt’s model. Shoppers want to get a luxury item as soon as it comes out and are more incentivized to buy because of the time limit, and competition to get to the site first to purchase items. Gilt-ii certainly takes advantage of this mentality. Hyman says he thought of the idea after observing his girlfriend become frustrating with losing items on Gilt. Magnuson and Hyman tell us that the bookmarklet’s functionality can be used on other time sensitive platforms, such as on OpenTable for restaurant reservations and sites like Ticketmaster for event sales. 1:30pm: Hackathon begins (please come fed or bring your lunch; afternoon snacks and beverages will be served) Thanks to iContact and Red Bull for keeping us fed and caffeinated! AirBnB. Additional venue and reservation details may be found here. AirBnB will also bringing air mattresses to the venue for those of you who do not wish to leave. 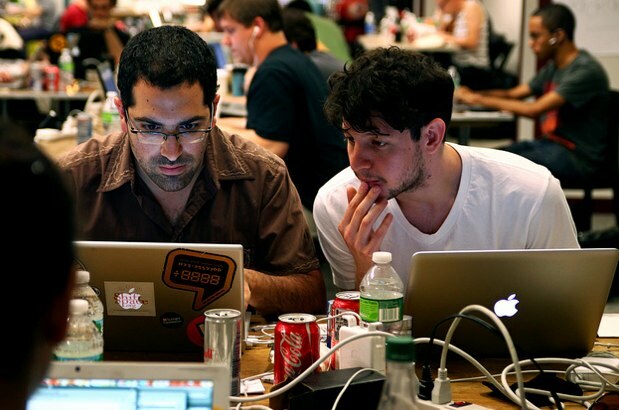 There are lots of ways to support and participate in the Hackathon. Please contact Jeanne Logozzo or Heather Harde to learn more. 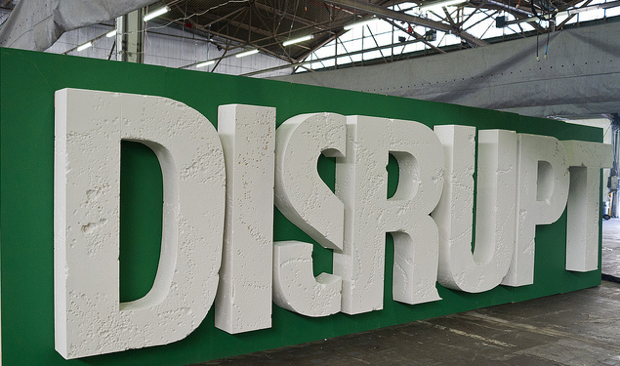 The TechCrunch Disrupt Hackathon is being organized by Tarikh Korula and Daniel Raffel on behalf of TechCrunch.